We have finally been home long enough this summer to go to the local Farmer’s Market. There is absolutely nothing like the taste of fresh fruits and vegetables picked that morning from the field. Like I wait patiently for the purple asparagus to make its Spring appearance, I wait (not very patiently) for the corn, the peaches, the nectarines, the berries, and of course the heirloom tomatoes. DD and I went to the market on Tuesday. If you have been following our Facebook posts, you will have seen the beautiful Red Haven Peaches I picked up from Martin Family Orchard. I have never had this variety before. They were the perfect level of sweetness and the juice was amazing. I had a plan in mind for these beauties as soon as I had my first sample taste. 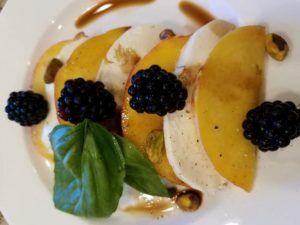 Last season, I saw a recipe for a peach Caprese salad that I never got a chance to try. The beauty of this salad is its simplicity. Slice a fresh peach and mozzarella cheese similar to the way you would slice a tomato. Fan on a plate alternating layers of peach and mozzarella, about four layers of each. Add fresh basil leaves, one to two grinds of fresh pepper, and drizzle with balsamic vinegar. Add a few fresh blackberries and a few shelled pistachios for an additional punch of flavor. Enjoy! If you have extra time, make a simple balsamic syrup and drizzle over the top. You can do this by adding about a half cup of balsamic vinegar and 2-3 tablespoons of honey to a pot. Bring the mixture to a boil, then simmer until reduced. Let the mixture cool (it will thicken while it cools). Slice the peach and the mozzarella cheese similar to a tomato. Arrange on a plate by alternating between the peach and the cheese. Top with a few blackberries. Grind one to two grinds of fresh ground pepper over the top. Sprinkle a few pistachios on the plate. If you have time, make a simple balsamic syrup by adding 1/2 cup of balsamic vinegar and 2-3 tablespoons of honey to a pan. Bring the mixture to a boil and then turn down the heat to a simmer until the mixture is reduced about 1/3. Cool. The mixture will thicken more as it cools.